All hockey fans are watching closely as to whether or not NHL Commissioner Gary Bettman will lose the fight to keep the Phoenix Coyotes in Phoenix, AZ and in/out of the hands of Blackberry-creator Jim Basillie. The result will mark Bettman's greatest victory or greatest failure in his tenure running the league. No middle ground here, folks. This is serious stuff because it essentially vaporizes Bettman's expansion plans for the NHL and questions how the league has essentially controlled their own legal system. According to court filings by NHL commissioner Gary Bettman, the third bidder in the Coyotes saga, IceEdge LLC, has in formed the NHL that they do not intend on taking part in the auction for the team scheduled for Thursday. That means the bankruptcy auction is down to a Rocky Balboa versus Apollo Creed-type showdown between the NHL and Canadian Superhero billionaire Jim Balsillie (not quite sure who is Balboa and who is Creed, but $140 million is certainly the underdog to $212 million). With both Jerry Reinsdorf and IceEdge out, bidders are officially dropping faster than pants in Paris Hilton’s house. Or for you die hard hockey fans, they are dropping faster than personal references in a Jeremy Roenick press conference. More here. Slightly larger than MSG suing the NHL for a website, more interesting than wherever the hell Dany Heatley will play, and, most importantly, this entire Phoenix to Hamilton debacle has nothing to do with the New York Rangers and Glen Sather. Whew. 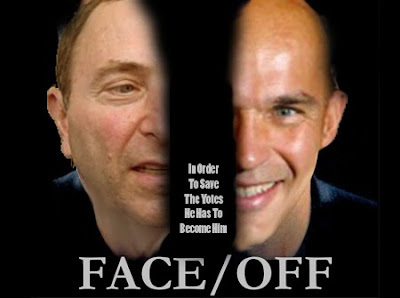 Truth be told, if you like him or not, Gary Bettman is one mean son-of-a-beech when he needs to be, but can money ultimately beat the small-man's iron fists!!? Enjoy the grudge match from a distance. I'd like to money win out and completely destroy the little Hockey furer's dreams of warm weather expension teams as well as cut the b@lls off any other asinine initiatives he might be plotting. Eventually I think the little hockey gremlin will prevail though. One, because the Gov't would see hardly any of the money from the sale. Two it paves the way for others properties to be uprooted from the US and sold somewhere else only to prosper and make more money the US gov't wont see. I do think Basillie would make the team financially sound, as he has more money than (God minus Bill Gates = blackberry), but whether he can attract the talent is another thing. He can win this with money, but ultimately who wants to play Hamilton? If Heatley rejects Edmonton, imagine how many free agents will reject Hamilton. Though, it is hockey mania in that little Toronto area, not dis-similar to the proximity between the Rangers and NJ Devils--- just without that dump called Newark.